Blessed Lammas and New Moon! August feels vibrant and energetic and fiery. Sparkles everywhere! Friday, August 5th: 11am-6pm, Faery Hair Friday at the Fernie Brae, 4035 SE Hawthorne, Portland, drop in! Wednesday, August 10th: 5-8pm, 2nd Wednesdays Happy Hour Sparkle Party at Belmont Station, 4500 SE Stark St, kids welcome until 7pm, drop in! Thursday, August 11th: 6-9:30pm, Faery Hair for Jamballah Pre-Party Meet and Greet, Gilda's Italian Restaurant, 1601 SW Morrison, Portland, free for Jamballah participants, drop in! Friday, August 12th: 11am-6pm, Faery Hair Friday at the Fernie Brae, 4035 SE Hawthorne, Portland, drop in! Saturday, August 13th: 3-8pm, Faery Hair at the Jamballah Vendor Lounge, Artist Rep Theatre, 1515 SW Morrison St, Portland, Free entry, drop in! Sunday, August 14th: 11:30am-3pm, Faery Hair at the Jamballah Vendor Lounge, Artist Rep Theatre, 1515 SW Morrison St, Portland, Free entry, drop in! 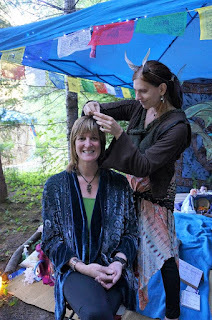 Friday, August 19th: 11am-6pm, Faery Hair Friday at the Fernie Brae, 4035 SE Hawthorne, Portland, drop in! Friday, August 26th: 11am-6pm, Faery Hair Friday at the Fernie Brae, 4035 SE Hawthorne, Portland, drop in! Saturday, August 27th: all day sparkling/flitting about for the 1st Anniversary Party at the Fernie Brae! 4035 SE Hawthorne, Portland, drop in! 6-9pm Anniversary Party! Sunday, August 28th: 11am-7pm: Faery Hair for the Hawthorne Street Fair at the Fernie Brae, 4035 SE Hawthorne, Portland, drop in! Wednesday, September 7th: 2-5pm, Faery Hair for First Wednesdays at Kyra's Bakeshop, 599 A Ave, Lake Oswego, drop in! Friday, September 9th: 11am-6pm, Faery Hair Friday at the Fernie Brae, 4035 SE Hawthorne, Portland, drop in! Wednesday, September 14th: 5-8pm, 2nd Wednesdays Happy Hour Sparkle Party at Belmont Station, 4500 SE Stark St, kids welcome until 7pm, drop in! Friday, September 16th: 11am-6pm, Faery Hair Friday at the Fernie Brae, 4035 SE Hawthorne, Portland, drop in! Friday, September 23rd: 11am-6pm, Faery Hair Friday at the Fernie Brae, 4035 SE Hawthorne, Portland, drop in! Friday, September 30th: 11am-6pm, Faery Hair Friday at the Fernie Brae, 4035 SE Hawthorne, Portland, drop in!